The world of leading RF guru/entrepreneur James Stoffo. 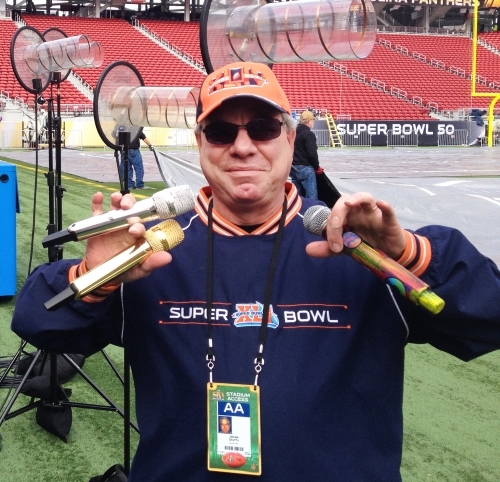 During James Stoffo’s career as an RF technician/frequency coordinator he’s worked a considerable list of some of the biggest events on the planet, including multiple Super Bowls, NBA All-Star games, and the Grammys to name a few, as well as huge corporate affairs. He’s also provided consultation for clients running the gamut from Disney World to Microsoft, and is a serial entrepreneur in having founded Professional Wireless Systems (PWS) in 1994 and Radio Active Designs (RAD) in 2014. On top of all that, Stoffo is a tireless advocate for arts, entertainment and culture in general; specifically in response to the challenges created by RF spectrum auctions and the increasing use of digital consumer/whitespace devices that share radio spectrum with other wireless technology – technology that is not only used in sporting and musical events, but also in nuclear facilities and military installations. Stoffo’s recent focus is building RAD, a manufacturing firm focusing exclusively on wireless intercom (com) technology co-founded by he, Geoff Shearing and Henry Cohen, and created with an eye to manufacturing wireless intercom solutions that can combat growing RF congestion and the ongoing impact of spectrum auctions. That focus also allows the company to avoid going head to head with wireless microphone manufacturers. Essentially, stepping on the toes of colleagues in the pro audio is the last thing the 54-year-old wants to do in what he describes as “potentially” the final chapter in his career. Coms have been Stoffo’s main focus throughout his professional life, beginning in the 1980s when he served as a communications radio surveillance technician in the U.S. Navy submarine service. But his passion for radio goes much farther back, all the way to his youth growing up on Staten Island, NY. It wasn’t until high school that he could get formal training in electronics and radio, and he did so in classes normally reserved for seniors. Immediately after graduating, he joined the Navy because, as he puts it: “I just wanted to go on a submarine. Between 1980 and 1986 Stoffo’s time was split between training at various military institutions – including electronic surveillance training at Pearl Harbor – and operational duties as a crew member on a fast attack sub based on the Pacific coast.